← Is cycling the new golf? A cityscape can look strangely different from a bicycle trail. Familiar landmarks and thoroughfares, viewed from behind the wheel of a car, afford a quick fix on a location. But from a bicycle saddle, riding along a trail, those landmarks and thoroughfares take on a different, disorienting perspective, and it’s sometimes difficult to figure out where you are. But that problem is being remedied along Fort Worth’s Trinity Trails network, thanks to new signage being put in place by the Tarrant Regional Water District, which oversees the Clear and West forks of the Trinity River in Tarrant County. Twenty-six new trail map signs that say “You are here” provide information on nearby amenities such as water fountains, restrooms, fishing piers and canoe launches. They also include mile markers so trail users can easily determine how far they are from certain destinations. Identification signs are also being placed on 26 bridges that cross over the Trinity Trails, allowing trail users to know at a glance where they are in the city. The Tarrant Regional Water District maintains the 27-mile Fort Worth Floodway as the local sponsor for the U.S. Army Corps of Engineers. It has built and maintains more than 40 miles of biking and walking trails and numerous trailheads that provide such amenities as restrooms, water fountains and parking areas. I’ve been riding the Trinity Trails for more than two decades, and it took a while before I always knew where I was in the city. Now, it will be much easier for newcomers, especially for those who come from out of town to ride our trails. 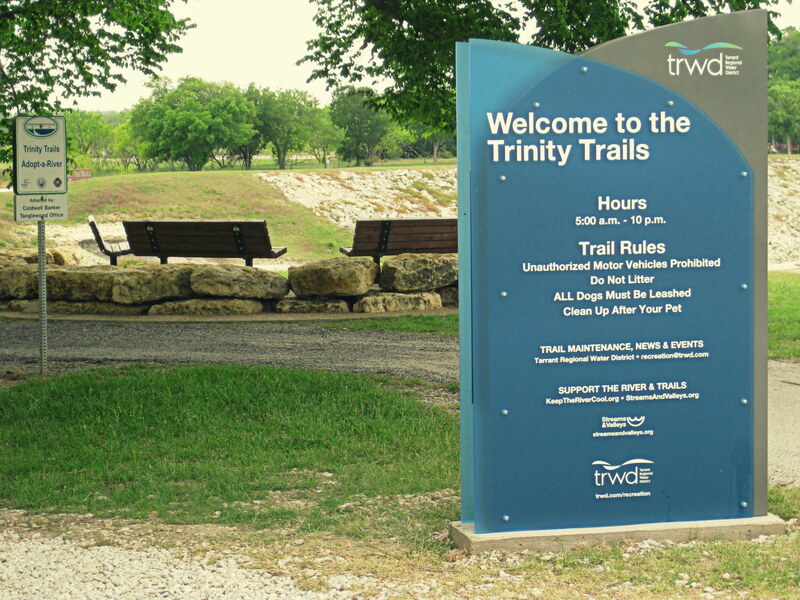 More information on the Trinity Trails is available at http://www.trwd.com/recreation. It is a real challenge to ride through some US cities when there are multiple interconnecting trails without reasonable signage. Here’s hoping the Trinity Trail led will expand accross the nation—especially major cities. 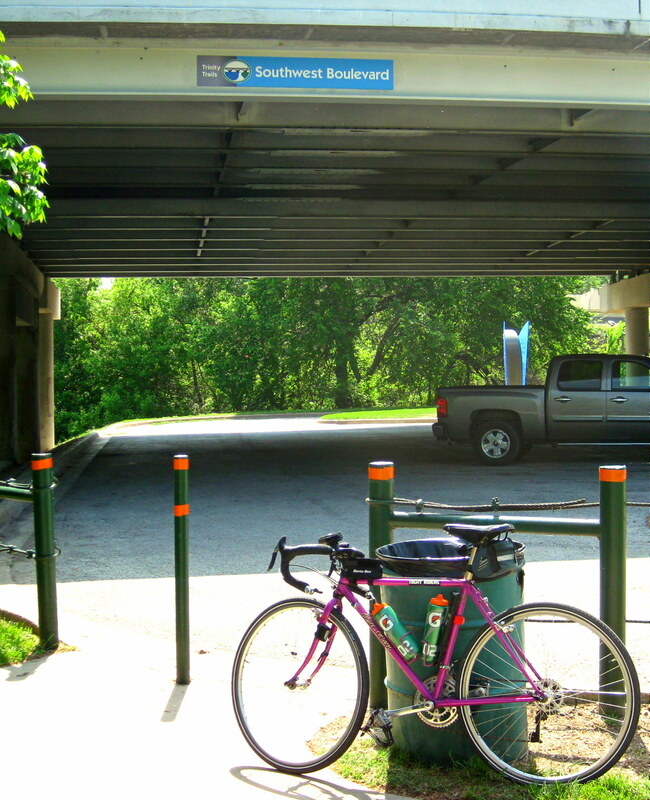 I’ve ridden the Ft.Worth Trinity Trail by bike many times since 1980. There is a fairly large square concrete surface next to the trail that has one small set of bleachers next to it. This square concrete area is between Henderson St bridge and 7th St bridge. It doesn’t seem to have any car parking area close to it. There is a dirt lane coming down the levee next to it. It is inline with the Chesapeake Building that is across the Trinity river from it. Someone has suggested it is a heliport. But it doesn’t have any lights or a wind sock. Doesn’t have a big “H” printed on it either. I and others thought it could be for roller hockey but it has no lights or water fountains nearby as well as no parking lot nearby. I’ve ridden past it many times and never seen anyone using it anything. 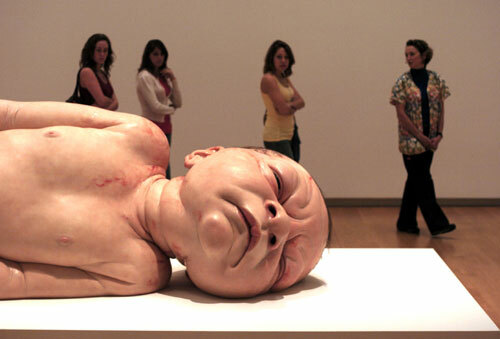 What is it for? No markings for sports boundaries can be seen other tan a white stripe along each edge. Any suggestions? I’ve seen that spot used for motorcycle and bicycle safety demonstrations, sometimes with cones set up as a slalom course. Not sure who puts on the demonstrations. Could be Boy Scouts for the bike demos.